Walking as quietly as I can through the half-dark dawn of dark timber, I hear a cow elk mew, calling her calf. I freeze. I consider the leap from hunting and gathering to herding and gardening a relatively short one in the trajectory of human evolution as well as my own. All flesh is grass, indeed. A life lived close to that reality is, for me at least, the existential experience of being alive. The same blood runs through deer, elk, cattle—and human, as well as bear, wolf, and mountain lion. I send an intention, a sort of prayer, to Bull Elk: Merge your flesh and blood, your spirit, with mine. I crouch and raise my binoculars, peering through the tree branches. Nothing for a few seconds, then a slight movement: elk legs. Every ranch is wildlife habitat, especially here in the Rocky Mountains, and even here some are better than others. On the Howell Ranch we manage our grazing to maximize elk habitat. The owners of the largest parcel, which Jim leases and now subleases to me, own that ranch specifically for elk hunting; and lease it to us for grazing because our management is designed to improve the forage quality for wildlife, especially elk. Rocky Mountain elk, Blue Creek unit, the Howell Ranch. We do that in three ways. First, we only run livestock during the summer; they are shipped home before rifle season. Second, we subdivide the landscape into smaller pastures and rotate our cattle through them so that their grazing is distributed evenly across the landscape, from creek to ridge and everything in between. These steep slopes are dominated by the relatively unpalatable bunchgrass Thurber fescue, which if not grazed for a few years becomes so stemmy and rank that neither elk nor cattle will willingly eat it. Because our cattle are stocked at high density for short grazing periods, they have to eat that Thurber fescue along with the more palatable grasses. Every few days they are moved to a fresh pasture. This way the cattle use most of the plants in the pasture, but also meet their nutrition requirements. Third, between grazing periods, every pasture has the rest of the growing season, and some if not all of the next growing season, to recover before our cattle graze it again. So while the pasture that the cattle are in is evenly grazed, most of the rest of the landscape has a significant amount of standing forage, and about half of the pastures are rested each year. A year of rest is not enough to make Thurber fescue unpalatable to elk. And we have lots of elk: a few hundred. Pat Magee's wildlife management class from Western State Colorado University visiting my camp at the Howell Ranch. The herd is moving perpendicular to the slope across the creek from me. They have not heard me because the creek muffles the sound of my boots on the snow and forest litter, which would otherwise give me away. You might think that this story is about hunting on the Howell Ranch. It isn’t. Other people pay thousands of dollars to hunt on this ranch, and on other ranches throughout elk country. Many of these ranches have more income from hunting than they do from livestock. So, for the most part, ranch managers or leaseholders like me do not hunt for free on the land we manage, even if we manage it specifically for deer or elk habitat. Instead, I hunted on public land, with the rest of the masses. I did not hunt the public land adjacent to the ranch, because that is in a draw-only unit and my bull license wasn't valid there. I find a spot in their path where I can see deeper into the trees, and I see some partial elk bodies move across. This year I hunted with my friend and a great conservationist, Lars Santana. He works for the USDA Natural Resources Conservation Service in Montrose, Colorado, where he is a multi-county rangeland management specialist—very similar to the job I used to do in Grand, Summit, and Jackson counties before I left to become a rancher and rangeland consultant. 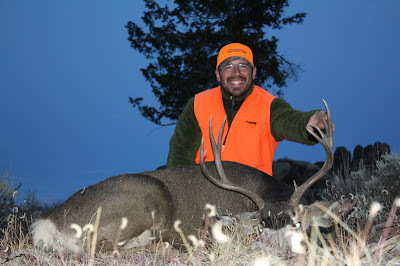 Lars had drawn a coveted buck deer license for a game management unit in the Gunnison Basin. Our bull elk licenses were also valid for that area. Then, the sound I’ve been waiting for all week: somewhere in that dark timber a bull elk calls. Not the forest-splitting bugle of the just-ended rut, but a bull for sure. We spent the first half of the season in deer habitat. On Tuesday morning we were glassing two sections of Lost Canyon when Lars spotted his buck. He tracked it until the sun rose and the wind shifted, alerting the buck to the stalking hunter’s presence. In the afternoon we came back. There wouldn’t be any elk here, so I set up a spotting scope on the far ridge and watched, that I might see where the buck would go if it was spooked. A violent wind shook the sagebrush as well as the spotting scope. I didn’t see the buck, but watched Lars disappear into some trees on the far side of an outcrop. I pulled out my new copy of Don Hunter’s Snow Leopard: Stories from the Roof of the World, and read an essay about one of the world’s great predators, glassing the area around the trees between paragraphs. The Gunnison Basin is not entirely unlike the arid, windswept steppes of central Asia. Just before sunset I heard a single shot. I never saw the deer. I packed up and hiked down to find Lars and the buck, just out of sight from my position on the far hill, behind that outcrop from which Lars made a perfect shot at 300 yards. We field dressed and quartered his buck, and packed it out to the truck in the dark. Lars Santana and his buck, Lost Canyon, Colorado. I lower my binoculars and raise my rifle, looking now through the scope—dialed all the way down for close range—for antlers. I see one, but it is a spike: a young bull, not legal to hunt. 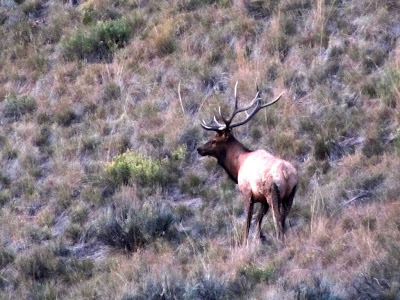 I see about forty elk, including four spike bulls. We lost a full day of hunting to the all-important task of processing the deer meat, which the two of us did ourselves on the kitchen counter. The buck provided enough meat to feed both of us, and Lars’s family, for a couple of months. But for a year’s worth of meat, at least one of us needed to harvest an elk. At one point I think I glimpse a full-size antler through the veil of trees, but I can’t be sure. The elk fade into the darkness. I stand, shake the numbness from my feet, stuff my cold fingers back into my glove, and creep on toward the meadow where I will set up in a spot where I can see farther, and hope that some more elk come up the creek. We spent the last few days on a steep, wooded slope on the Uncompahgre National Forest, in a mosaic of spruce-fir forest, aspen forest, and small open parks. The park where I was hunting was not unlike the higher-elevation part of the Howell Ranch. Here too was Thurber fescue. But here it grew in tall bunches, mostly not grazed. The grasses in between the bunches, especially Kentucky bluegrass, were mowed to within a few inches of the ground. The culprits left their sign all over and around the park. This morning there was a fresh pile of it on the log on which I’d been sitting last evening. The next evening, the last of the season, I hear the elk again, through the trees. They are just across the boundary, on private ranch land. So close, and yet so far. Ranching and hunting seasons ended, I go home with a cooler of deer meat. My inner hunter-gatherer thrills at presenting meat to my gardening godess. I will have to buy some meat too, this year: grass-fed beef from a well-managed ranch run by people who, like me, love their land and their animals, and participate joyfully in the circle of life. Beautiful pictures and very informative blog. 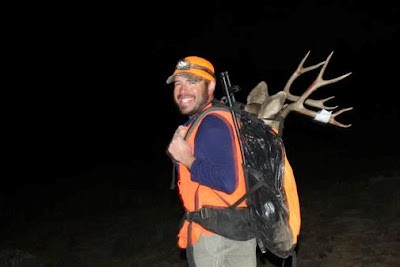 As an outdoor enthusiast, what we always look for is adventure, including the setting of complete meat processing, is it like how http://www.huntingtexastrophies.com/ does? I've never experienced hunting. It's one of the items on my bucket list. I am not that skilled and prepared. But I hope I'll be able to do it. Here we see that farm particularly for elk chasing; and rent it to you for brushing on the grounds that your administration is intended to enhance the rummage quality for untamed life, particularly elk was truly awesome. These precarious inclines are ruled by the generally unpalatable bunchgrass Thurber saves. Farm directors or leaseholders to don't chase for nothing on the land that you oversee. Nice and informative article. This article helps me. Keep doing this. Matt Barnes provides ranch and rangeland stewardship for whole-systems resilience through his company, Shining Horizons Land Management, LLC. He is also a Research Associate with the Northern Rockies Conservation Cooperative, and was previously Field and Research Coordinator at People and Carnivores. He managed the Howell Ranch in western Colorado from 2010 - 2012. He is a Certified Professional in Rangeland Management, past President of the Colorado Section of the Society for Range Management, and serves on the editorial board of Rangelands, where he recently edited a special issue on Strategic Grazing Management for Complex Creative Systems. He is a writer, photographer, and artist, exploring the American West and rangelands of the world by foot, horse, boat, pickup truck, and motorcycle. All content copyright (C) Matt Barnes. Watermark theme. Powered by Blogger.